Five girls have been kidnapped in different parts of the country but the discovery of six left arms, in a circle in the woods, means that there's another girl missing – but why has no-one reported her gone? The team in charge of the investigation is headed by a civilian – criminologist Goran Gavila. Working for him are several law enforcement professionals which different specialisms. Newly added to the team is missing-persons expert Mila Vasquez from "outside". She is welcomed into the team with different degrees of friendliness. Mila has dark secrets, ones which make her good at her job. The team nickname the kidnapper/killer "Albert" and when the arrest of a man for a traffic offence leads to the discovery of the dead body of one of the missing girls in his boot, the case appears closed. But it is far from it. The man is the first of several criminals and crime scenes revealed by the machinations of Albert, who remains one step ahead of them all. Interspersed amongst the main narrative are two other threads: an incarceration told from a child's point of view and correspondence between a prison and the authorities about a prisoner who refuses to give his name and who removes all traces of DNA and fingerprints from his cell. I wasn't expecting to enjoy this book as it's about a child-killing serial killer and it does contain some unpleasant scenes, however it is so well-plotted that I was sucked in and couldn't wait to get back to it. There are some fabulous surprises at the end which I had no inkling of. I was only let down by the use of the supernatural/paranormal to acquire some information where I would have preferred a more believable police approach, nonetheless it did fit well with one of the sub-plots. Like Hakan Nesser's Van Veeteren series, THE WHISPERER is set in an undefined country. Both imperial and metric measurements are used and there is the possibility that it is set in America until you come to distances measured in kilometres. It certainly adds another level of intrigue. The investigation provides scope for detail on forensic techniques and psychological theories and rather than slowing the action down I found it added to the interest. 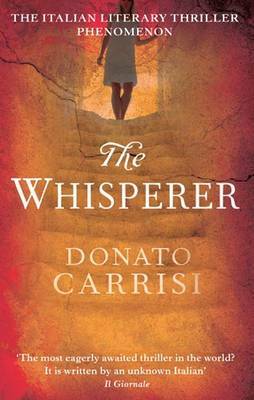 THE WHISPERER is an unusual book, which won't be for everyone, but if you like a gripping plot with unusual characters, and can cope with an invented country and a touch of "woo-woo", then this might be for you.